Superdry wants to create a global lifestyle brand by selling premium, high quality and affordable clothing to people. Its brand may not be as recognisable as leading sportswear brands such as Nike or outdoor brands such as North Face but its distinctive logos with Americana and Japanese graphics are not an uncommon sight. Retail stores – these are owned by the company in established and mature markets such as the UK and continental Europe. In secondary and emerging markets the store base tends to be owned by franchisees or licensees. At the end of April 2018, Superdry had 246 owned stores, 394 franchised stores and 18 licensed stores. Retail stores account for 44% of annual revenues. Internet – The company has lots of websites across the world in order to sell direct to consumers. It also uses online marketplaces such as eBay to sell items of stock. Internet sales account for 19% of annual revenues. Wholesale – Superdry sells its clothes to independent retailers and distributor partners. This channel accounts for 37% of annual revenues. The company makes most of its clothes in partnership with third party suppliers in Turkey, India and China. A quick look at the company’s financial performance suggests that it could be quite a decent business. Profit margins and ROCE are very reasonable. The problem is that the trend in these key measures has been downwards. Superdry’s shares are in the doghouse at the moment having slumped by over 37% since the start of 2018. Whilst it has been generally good at growing its revenues, the company’s business model is coming under intense scrutiny from analysts and investors. Sentiment towards the company has not been helped by the departure of one of its founders and the imminent departure of its finance director. 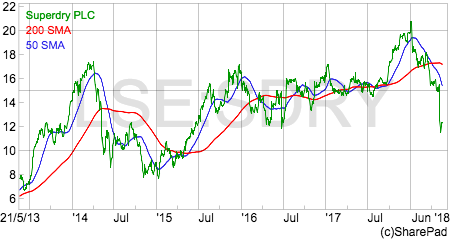 The year to April 2018 looks to have been a satisfactory one for Superdry based on its recent trading update. Global brand revenue – based on the prices paid for products by customers – has grown by 22.1% and total revenue by 16%. This is pretty healthy and not the sign of a fading brand. What’s concerning people is how that revenue is made up – in particular the sharp slump in trading at the group’s retail stores where revenues fell by 6% during the last quarter of the year. This is important because there are different profit characteristics from Superdry’s different revenue channels. Sales from the internet and from wholesaling are based on a relatively asset light model. Once sufficient scale has been reached, there is a reasonable amount of positive operational gearing from their sales (despite delivering lots of parcels to different customers). On a fully costed basis, wholesale and now internet sales are more profitable than sales from stores according to the company. That’s a scary number that quite rightly unnerves plenty of investors. However, it seems that life for Superdry’s stores is not expected to get better any time soon. The company’s guidance for the year to 2019 is for high single-digit percentage revenue growth driven by double-digit growth in wholesale and internet sales. This implies very little – if any growth – from retail stores. If both wholesale and internet grow revenues by 15% in 2019, then to get to overall revenue growth of 9% needs 1.4% revenue growth from stores. 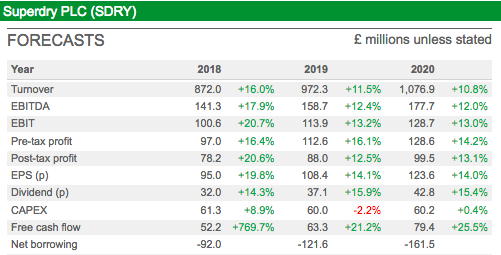 However, if the maturation of new stores in 2017/18 is taken into account (new stores operate at around 70% of their potential revenues in their first year) as well as growth from 5% additional selling space in 2018/19 this would imply another year of negative like-for-like sales growth. This would be against a set of very weak comparable LFL sales figures in 2018 and is likely to put further pressure on store profits unless the company can make cost savings elsewhere. It is difficult for the outside investor to work out the implications of this trend. Are the falling sales in Superdry’s stores due to a weakness of its markets or due to the fact that more people are buying online? If it is the latter then will the profits from the shift to online sales offset the lower profits from the stores? Superdry has not mentioned that it will close any of its stores. It does however have some flexibility in its lease obligations. The maximum length of lease that it is now committing to is only five years before a break clause which means that it will have the flexibility to exit if store profitability is disappointing. The company is also only opening owned stores where it can get a 25-month payback on the basis of its expected post tax profits. Although there has been an impairment (a reduction in value on the balance sheet) of its Berlin store, I am not expecting Superdry to announce that it has a problem with loss-making stores any time soon. The other question is what does this mean for Superdry’s 394 franchised stores? The company’s strategy is to increase its franchised selling space by around 20% per year. This makes sense from the viewpoint that Superdry does not have to sink a lot of cash into these stores but does it make sense for the franchisees if more sales are moving to the internet? Franchising can have a lot of attractions for the franchisor but only if the returns are attractive enough for the franchisees to take on new stores. Superdry operates with too much stock in my opinion and it is costing it money. 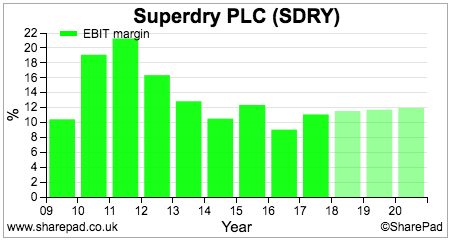 Stock as a percentage of turnover has consistently around the 20% which is much higher than most clothing companies and retailers. 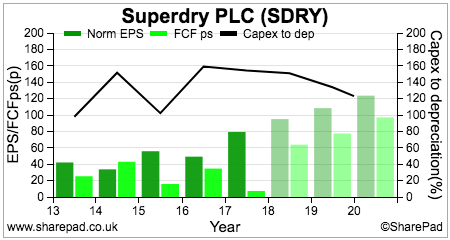 Selling off excess stock cost the company around 100 basis points (a 1% total reduction) in gross margin last year. That might not sound much, but on sales of £872m, that equates to lost profits of £8.7m which is significant given expected operating profits of around £100m. The good news is that the company is doing something about this issue. It is attempting to take around six week’s sales of stock out by the end of summer 2018. 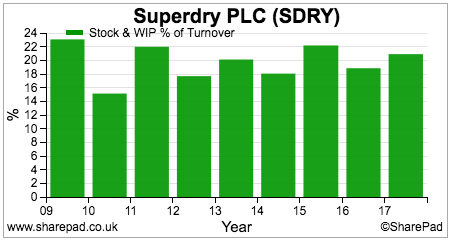 Stocks increased at a slower rate than revenues in the year ending April 2018 and hopefully this trend will continue in 2019. The company has already confirmed that 2018 forecasts will be met. 2019 forecasts might be very slightly too high, although the current weakness of sterling might help it meet the revenue forecasts. 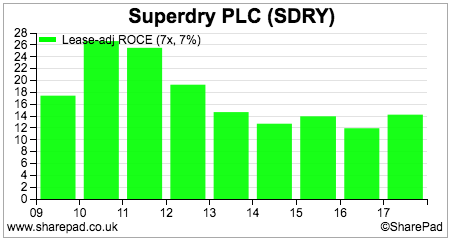 Assuming 9% revenue growth as guided and a 0.2% move up in operating margins – due to efficiencies offsetting margin dilution from selling off excess stocks- would give an operating forecast of around £111.2m compared with current consensus of £113.9m from 11 analysts. The key unknown is how the profit mix will pan out if LFL sales in retail stores continue to deteriorate. This is the key risk to consensus forecasts as I see it. There’s certainly plenty of questions to ask of Superdry both in the short and long-term. Clothing and fashion can be very fickle environments which makes it difficult for some people – including me – to feel comfortable with the long-term prospects of the business. 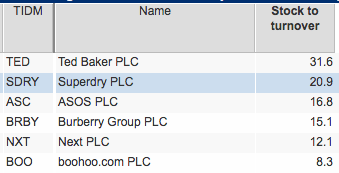 That said, Superdry is clearly not a fading business at the moment given its growth rates seen in wholesaling and online. What makes this share interesting is its valuation. It trades on a one-year forecast rolling PE of just 11.4 times and a forecast EV/EBIT of 9.4 times. For a business that is expected to deliver double-digit percentage increases in profits these valuations are hardly demanding especially when you factor in the net cash balance sheet position. I’d like to see this company’s free cash flow performance improve. Capex of around £60m remains a drain on free cash flow compared with depreciation and amortisation of around £40m as money is invested in new stores and the digitisation of the business. This explains the company’s modest free cash flow conversion ratio in recent years. Given the changing world of retail and the shift towards online retailing, I’m not sure it makes sense to put more money into high street stores. Money might be better spent on warehousing and IT systems to grow its internet operations. I think Superdry could become an interesting special situation. Its price tag has come down significantly, but perhaps a change of strategy – cutting back on bricks and mortar stores and moving more online – is needed to wring more value from it.